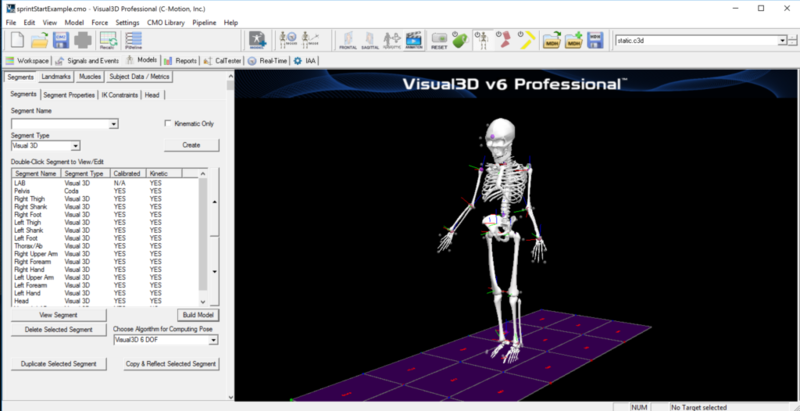 Visual3D is the premier biomechanics analysis tool for measuring movement and force data as collected by almost any kind of 3D motion capture system. It is a Microsoft Windows application. It provides the calculations needed for kinematics and kinetics – including support for instrumented treadmills. It includes the latest mathematical techniques for optimizations, signal processing and filtering, inverse kinematics, complex biomechanical modeling, forces and force structures, and much more. Custom, traditional, or standard biomechanical Models. Model development is rapid, graphical, and unrestricted. Visual3D modeling supports Global Optimization, 6 DOF, Conventional Gait, custom marker sets, virtual markers, segments, and more. Modeling is done graphically but allows for entry of direct measurements, inverse kinematic settings, inertial properties, graphic overlay adjustments, and much more. Kinematics, Inverse Dynamics and custom calculations. 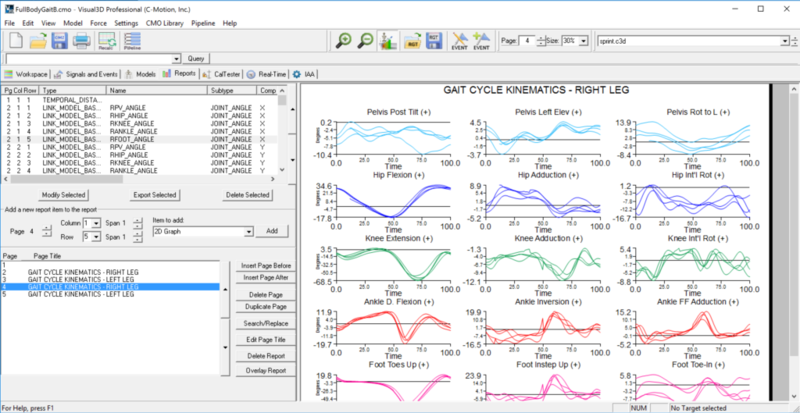 In addition to metrics such as joint angles, moments, center of pressure, signal filtering, DFT, center of mass, energies, rotations, volumes, derivatives, and much more – you can also write your own computations. 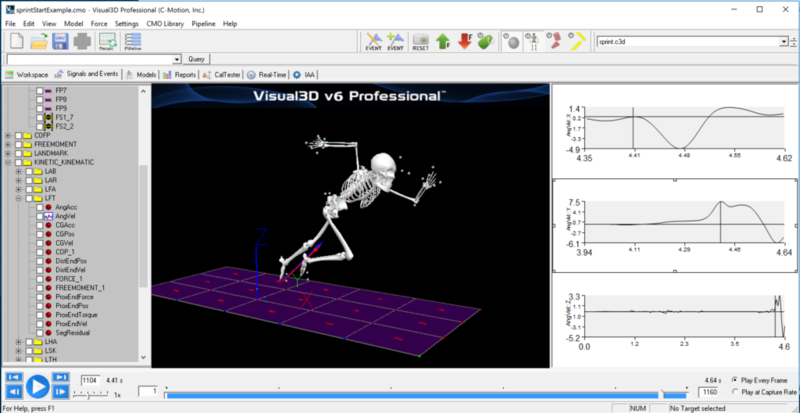 Full control of input parameters, Euler angles, rotation order for Cardan angles, coordinate systems, and other parameters make Visual3D the most powerful analysis tool for biomechanics available. Integrated Support for Force Sensors, Force Platforms, Instrumented Stairs, and Instrumented Treadmills. Export to OpenSim. Global optimization applied and .mot and.xml files produced. Comprehensive Data Management of C3D files. Subject tagging and model association allow for integrated data sets. External indexing allows for integrated access to libraries of data, subject, and files. COP Path; Ground Reaction Force Data; Helical Angle; Joint Acceleration; Joint Angle; Joint Rotation; Joint Force; Joint Moment; Joint Power; Joint Power Scalar; Joint Velocity; Segment CG Position; Segment Proximal Joint; Segment Distal Joint; Segment Velocity; Model Energy Scalar; Potential Energy; Rotational Energy Terms; Rotational Energy Scalar; Segment Energy Totoal; Translational Energy Terms; Translational Energy Scalar; Linear Momentum; Angular Momentum; Segment Residual; Model COG; Segment Progression Angle; Target Path; Muscle Length; Model Moment of Inertia; Model Angular Momentum; UD Power; and much more. Nexus; QTM; Motive; Cortex; Etc.